Programme to include: Sonnet Settings by Shostakovich, Weinberg, Kabalevsky and Sviridov. Russian composers have a long and distinguished history of engagement with Shakespeare. Today the fine French bass-baritone Frédéric Albou is joined by pianist Michelle Assay in settings of the Bard’s sonnets by Soviet composers Shostakovich, Weinberg, Kabalevsky and Sviridov. Frédéric Albou is a passionate and intense singing actor. 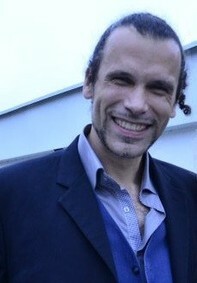 The Parisian bass-baritone Frédéric Albou’s exceptionally diverse repertoire encompasses Ancient Greek music (with Ensemble Kérylos), Renaissance polyphony (with the Huelgas Ensemble), baroque music (with the Concert Spirituel), bel canto opera (Handel, Pergolesi, Mozart, Rossini), romantic opera (roles such as Sparafucile, Amonasro, Wotan, Zurga, Gremin, Count des Grieux), modern opera (Kurt Weill, Benjamin Britten, Hans Werner Henze, Carlisle Floyd, John Adams and Christophe Belletante whose Tristan was recently revived with Albou in the title role), Lieder (e.g., Schubert’s Winterreise), songs in various languages (notably romances by Tchaikovsky and Rachmaninov, as well as the little known Vladimir Enke) and sacred music. As a soloist his primary focus is on premieres and neglected scores and composers. 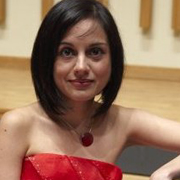 Michelle Assay was born in Tehran and studied in Kiev at the Tchaikovsky Academy, graduating with a Master’s degree in piano performance, musicology, pedagogy and criticism. After a year in Canada, working mainly as actress and piano teacher/performer, she returned to Europe to work with Carine Gutlerner at the Erik Satie Conservatoire in Paris, where she obtained her DE (Diplôme d’Etat) and was laureate at international competitions. At Manchester University she has been performing with Quatuor Danel and in piano duo/duet with David Fanning. Her multi-cultural background is reflected in the breadth of her taste and repertoire, and in her innovative approach to teaching. Michelle Assay is currently studying at the Sorbonne, where she completed her MPhil with a dissertation on Mieczyslaw Weinberg’s relationship with Shostakovich, and where she is now working on a doctoral study on the topic of Hamlet in Russian Music and Visual Arts. As well as the Sorbonne, Michelle Assay is a PhD candidate at the University of Sheffield, Russian and Slavonic Studies. She is also collaborating with David Fanning on a biography of Weinberg and on a major survey of the Symphony in the Soviet Union.